Valley Technologies, one of Zimbabwe’s 15 licensed IAPs, has started an ad campaign to launch its 4G internet services. A local teaser ad titled “What would you expect from a TRUE 4G NETWORK” appeared in today’s papers. The ad’s call to action is for consumers to define what 4G means to them. It invites readers to visit www.true4g.co.zw to respond. 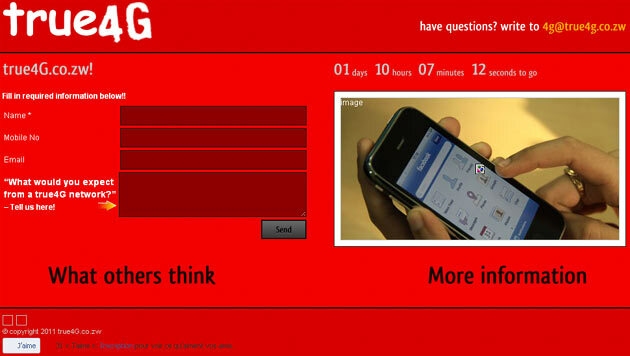 The campaign also has a Facebook page where users can ‘like’ the page and respond to the 4G question. The page has some 32 likes so far. Valley Technologies itself is not mentioned in the ad, but it doesn’t take much to put 1 and 2 together; the colors used, the advertising agency, and finally a few calls to our sources to confirm. For those wanting to dive right into by the 3.5G-LTE-4G debate we believe the camps are totally split and we will leave this for another day, but you can put your comments below. You can even enter your own 4G expectation checklist for Valley Technologies in the comments here. Whatever the case is with Valley Tech’s 4G, this is welcome news and we’re excited; More competition, more choice for internet users, and hopefully lower prices. The countdown on the site says we will all know more on Thursday. Update (13 July 2010) : We’ve just been notified that Valley Technologies has changed name to Spiritage Communications and the the Spiritage company behind True4G is a new one called Brodacom. More details here. Please just launch the damn thing..
surely we dont need to be teased just show up and prove yourself… and remember we are watching you…. how about just something that makes me fetch pages the same way I’d fetch a resource on our office network. I can copy a whole movie from another server in minutes. You can call it whatever you want, I just want to be able to do that and not be told it’s dependent on the weather, or the number of people on the network, or any of that nonsense providers use to justify lower quality service. 4G lost its meaning way back and so did 3G. Just give us good internet. We’ll appreciate good internet when we get it. really. What would I expect from a true 4G network? Them not to spend time defining what G it is and just give service. We’re tried of hearing about G this G that without any meaning on service quality. If Data Operators in SA are banned from using 4G in adverts because none of them has true 4G there then how can a company in landlocked Zimbabwe make such claims. Where are the advertising watchdogs? 4G does not mean a Gigabit network it refers a Gigabit going to the consumer! Valley don’t dissappoint me please!!! “true4G” what a name. Zimbaweans might be educated but they sure as hell lack creativity it sounds like “2” “4” “G”. After such an inflexible name they better hope that they don’t consider using 3G or 5G (whenever it comes) or the’ll have to stick little “+1G/-1G” stickers on all their branding. I can imagine their AD ” Get “true4G -1G” for the ultimate 3G experience. talk about voluntarily putting yourself in a corner. The name is almost as bad as Skwama. Yah yah!!! before you vultures pounce I am aware that I made a spelling mistake in my previous post. I meant to write Zimbabweans not Zimbaweans! good speeds at good prices. no point being fast if people cant afford it. good service, never mind price but it should be value for money. guys u can visit their facebook page and see the rhetoric the sales and marketin guys ar ritin. Lolest: If you click on “More Information”, you get a black and gray Lightbox/Popup. You see chikwata, If you are to get some template and play around with the colors, no problem. BUT, do a good job of it!!!! Change all the colors. Do a “Find And Replace”.